I passively monitor biding issues and sightings locally by receiving email from a list serve set up by our local chapter of the Audubon Society. I read or at skim the emails as they come in to see if there is anything interesting going on in the area. Sometimes information that peaks my interest comes through. 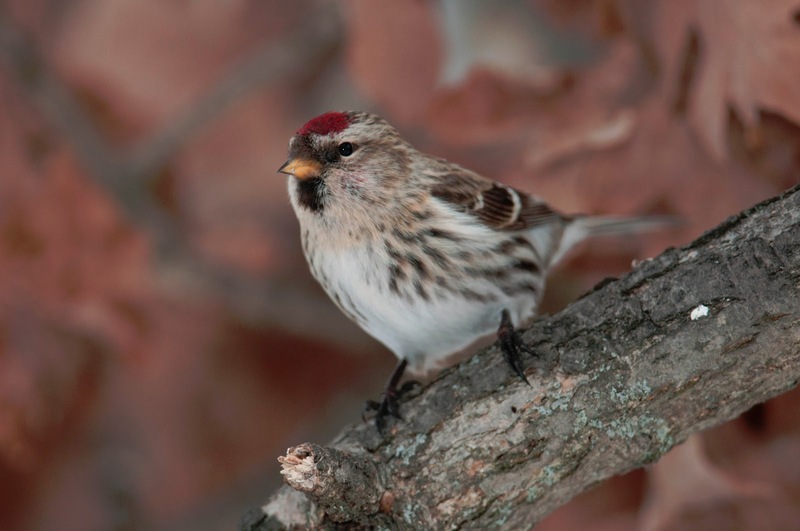 Recently there had been several emails sent out of people in the area reporting Redpolls in the area. 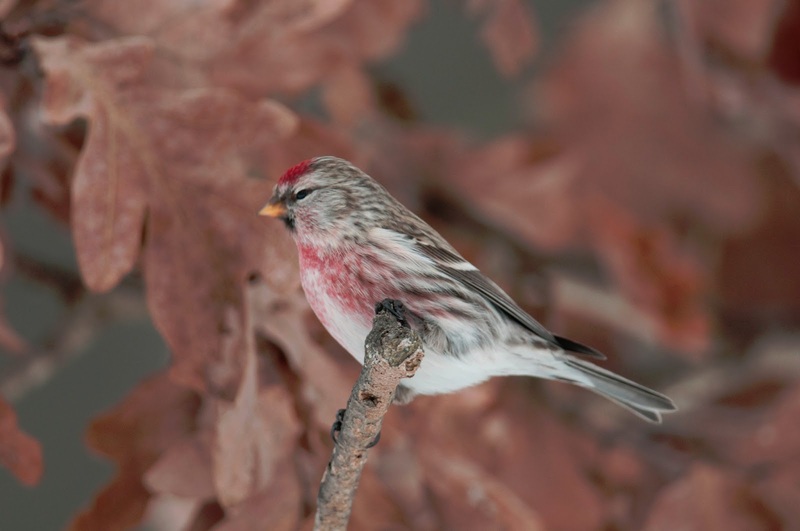 I found this interesting because I had been fortunate in the past to see Redpolls for a short period of time where we currently live shortly after moving here. I had not seen them since, so I am always interested when hearing of an opportunity to see them again. As I began to see an increasing number of reports on Redpoll sightings coming in I started to get hopeful that they would return to my feeders as well. I began to be more diligent about making sure there was seed in my feeders so that if they did show up they would find food and hopefully stick around instead of moving on. One day I looked out the window at the feeders and quite unexpectedly saw that there was a Redpoll mingling with the other birds that are commonly seen at the feeders. A few days later I happen to look out at the feeders and saw there were now two Redpolls in the mix with the other birds at the feeders. This pair appeared a few more times over a few days. I did not initially go out to photograph the individual that showed up or the pair I saw. I did not want to scare them off. I was hoping that the presence of the ones already here would draw in more individuals. 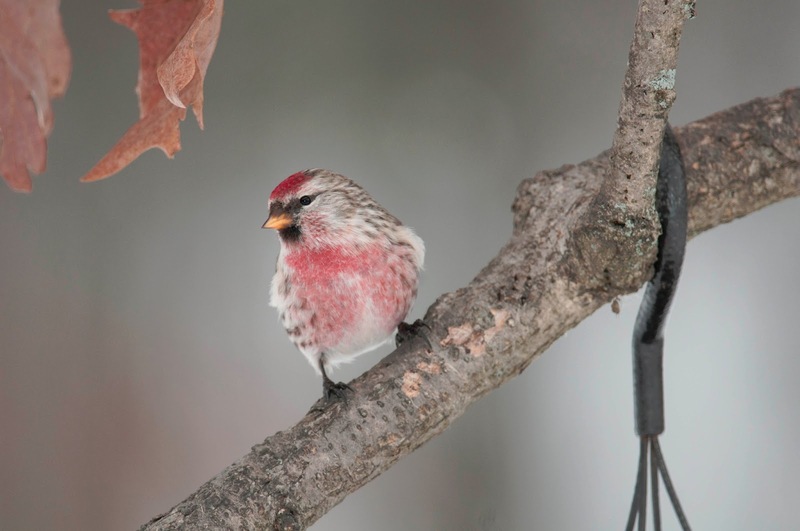 I had read reports of large flocks of Redpolls and I was hoping for a large flock sighting of my own at my feeders. One day I was on the phone with my dad and I noticed movement outside in the treetop where my feeder is. I walked towards the window to investigate, while talking, not really thinking much about it. 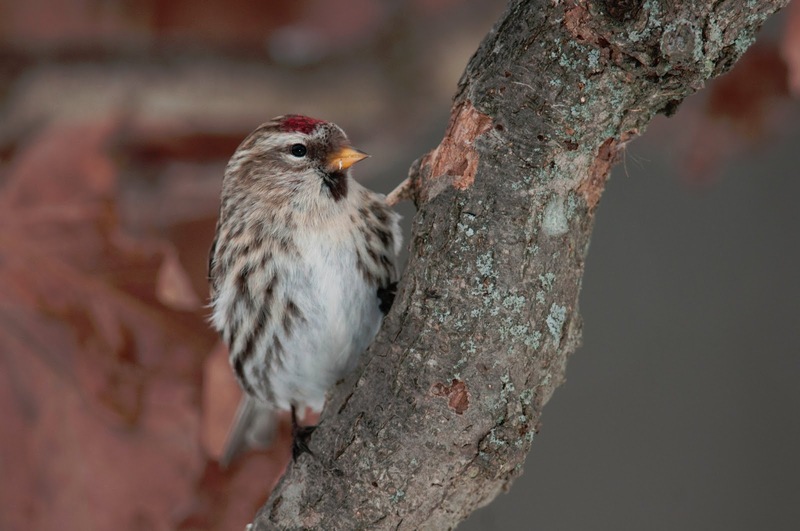 When I got to the window I exclaimed to my dad that I had a huge flock of Redpolls in the tree. Now the flock probably wasn’t really huge by comparison to other sightings but it was certainly more than I had ever seen at one time and I was excited and I am sure I exaggerated due to my excitement. I began to try counting the number of Redpolls in the flock but it was difficult. The flock was in constant motion. Every time I would get into it, they would move. I could only confirm a count of 20 but there were clearly more than that present. I enjoy birding but I am by no means an expert. I have never really tried to count a large number of birds all at once. Despite my challenges with counting the birds this is the opportunity I had been waiting for. I wanted to get out there and take some photos. However, my gear was all packed up as I had not used it recently and this being upstate NY in the middle of Winter with several inches of snow on the ground, it required me to scramble around to dress quickly in boots, coat, gloves, and hat. Once I was geared up I quietly went out the side door as opposed to the door leading directly to the location of the flock because I didn’t want to scare them off. As I cautiously moved around the house to where I had seen the flock, they were nowhere to be found. This was clearly a disappointment. I went back in the house, but this time I kept all the needed gear in easy reach in hopes that the flock would return. As luck would have it my hopefulness and preparedness this time was rewarded. 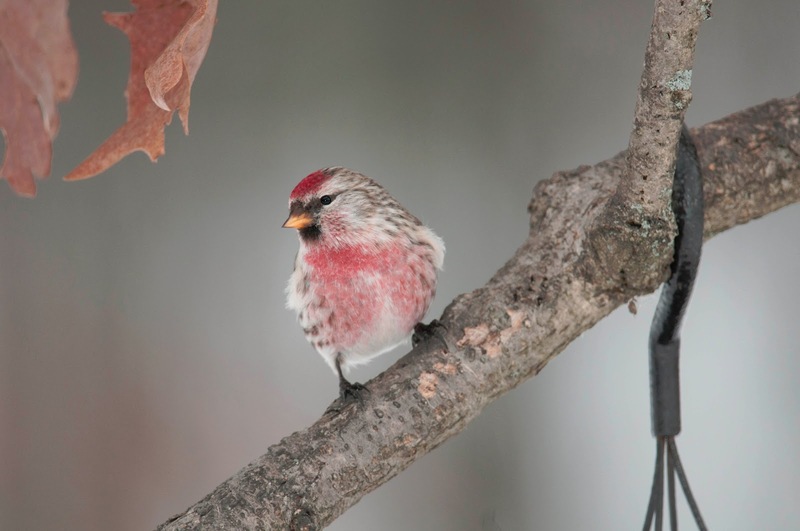 After a few hours, I looked out the window and saw that there were once again Redpolls at the feeders. It was not as big a flock as before but it was still a significant number. I decided against wasting time trying to count them and immediately got dressed and snatched up my camera and went out seeking photos of these elusive birds. In this region of upstate NY in the winter it hasn’t been sunny very often. The sky is often overcast and gloomy. There has not been much nice light for photography. For my photography, I prefer to use natural light whenever possible, as probably most photographers do. While the light was sufficient to get at least decent photographs, I decided to go against my instinct stick with all-natural lighting photography because I thought I could get better photos if I used a flash. My preference is to stick to the KISS philosophy, which was drilled into me at a young age. Keep It Simple Stupid. To me adding one more variable such as flash just complicates matters and increases the likelihood something will not work out quite right. So there I stood watching the feeders as the Redpolls flitted about snatching up seed. These little buggers were not an easy subject. A few of the Redpolls were content to sit on the plat form feeder and eat for several seconds at a time so I snapped a few photos of that behavior as documentation type photos. However, that was not the photo I was after. 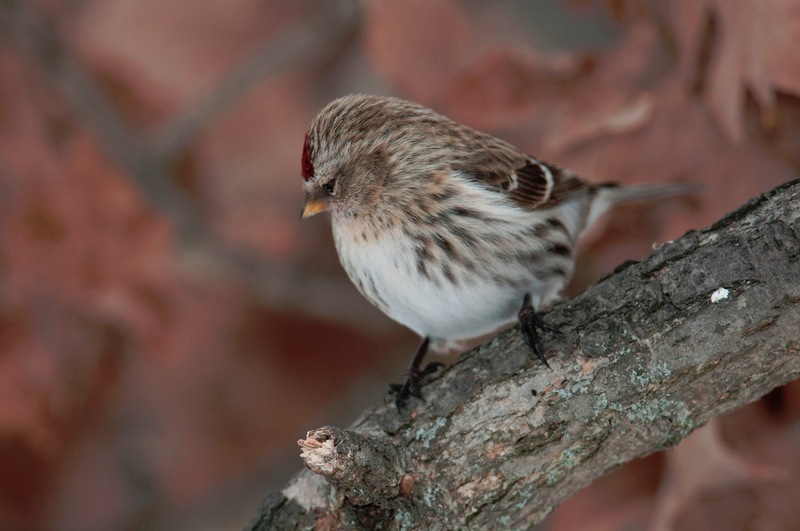 I wanted photos of Redpolls perched on branches with the darker background of the woods in the background out of focus. I stood still and visually tracked individuals as they approached the feeder. They would flit from branch to branch getting progressively closer. I watched to see what path the Redpolls often took. 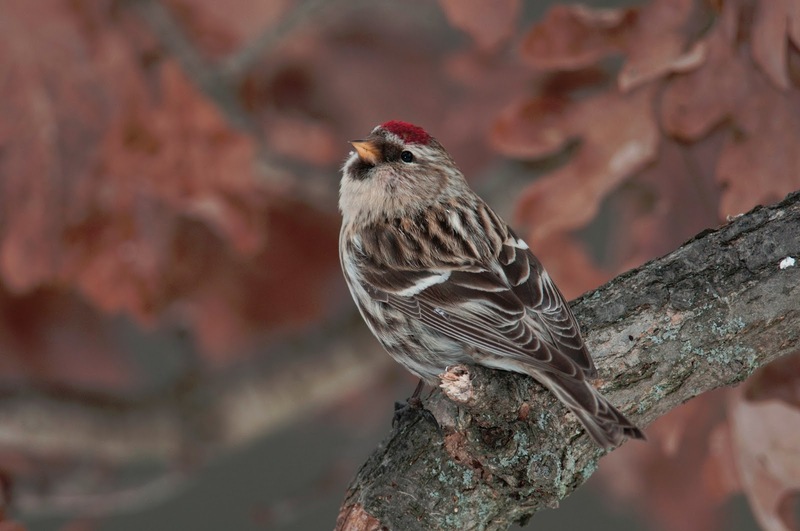 I wanted to be able to anticipate where the Redpolls would land and be ready when they landed there. Sometimes I was spot on and got the shot and sometimes I was not ready or simply not fast enough and missed the shot. It was a fun experience to photograph this group of birds that I do not get to see often. I am hoping they will be back to provide me with another opportunity to learn their behavior and improve my ability to photograph them.